Dr Liseau and colleagues have only two data points to play with - a 'before' and 'after' shot of this objects 10 months apart. The object may be just beyond the Kuiper Belt, in which case it's a Trans-Neptunian Object of similar size to other dwarf planets in that zone. On the face of it, this seems to be the most likely possibility, given the regularity with which these objects are now being discovered. In which case this would be the most distant 'scattered disk object' yet discovered, probably in the region of 100AU away. Dr Liseau and his team think that this object may be something more exciting than that, however. They wonder whether it might be a large terrestrial planet further out - a 'super-Earth' located about 300AU away. This would be highly controversial, because such an object would inevitably be identified with the mythical planet Nibiru (3), whose orbital period of 3600 years provides us with a semi-major axis of about 250AU. In which case, this new planet might be Nibiru located somewhat beyond its mid-range. If this was to be shown, as further data comes in, then the entire astronomical community would likely go into total meltdown. There are hints of that already (1). One problem seems to be the inclination to the ecliptic that such an object would exhibit. At over forty degrees, a super-Earth would be seriously out of kilter with the rest of the solar system's planetary system, although such an inclined orbit would certainly satisfy Zecharia Sitchin's predicted parameters for such an object (4). The last possibility is that they've found 'Nemesis', a very cool brown dwarf object far out in the distant reaches of the outer solar system. Such an object might be of the order of tens of thousands of astronomical units away, in keeping with the presence of Matese's outer solar system companion 'Tyche', which is thought to be the cause of an observed non-random distribution of long period comets (5). 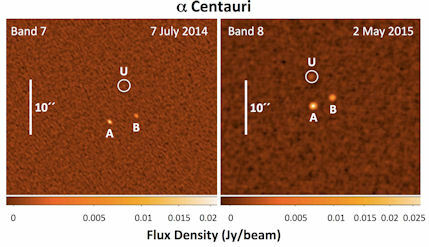 This effect has also been noted by other researchers advocating the presence of a distant sub-brown dwarf (6.7), although some argue that the effect is due to in-built selection bias (8). The location of this purported new object is interesting because the position of this object is such that it lies between us and our nearest stellar neighbour, Alpha Centauri, in the dense star field of the Milky Way in the southern skies. 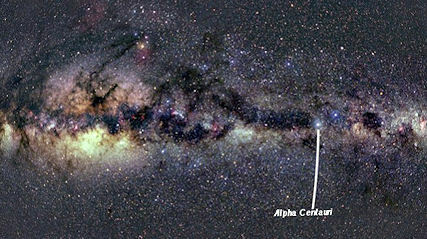 Its apparent motion, however, is not in keeping with being a sub-stellar member of the Alpha Centauri system (2) - as is the case with the red dwarf Proxima Centauri (α Cen C ), which orbits the central binary star system (9). If it was, then this object would be Alpha Centauri D, and would be bright enough to also be a red dwarf star, like α Cen C. Its lack of strong infrared signature seems to rule such a possibility out (10). This is quite a range of values, and covers a sizeable, but not very exciting comet/asteroid located in the region of the outer gas giants, all the way up to a massive interstellar object cruising through outer reaches of the solar system. The location of Gna in the constellation Aquila is also interesting, because it corresponds with the predicted location of an outer solar system companion made by John Murray in 1999 (6, 12). If this all sounds too good to be true to you, then you're not alone. The speculative nature of these two scientific papers has brought down a ton of criticism on the authors. In online forums, astronomers have lined up to argue against an outer solar system companion solution. Other, more prosaic explanations have been offered for the bare-bones data (13, 14), any one of which which may turn out to be the truth of it. Such strong criticism will likely put off other astronomers from speculating about massive outer solar system bodies when they pick up these kinds of fast-moving blips in the future. Which is a shame. This is where peer-review becomes peer pressure. Nonetheless, what the ALMA scientists have achieved is to get the ball rolling on a close and intense study of these two candidate objects, with the whole world watching. A number of assumptions are built into the calculations regarding the future trajectories of these potentially dangerous Near Earth Objects (which are mostly asteroids, but sometimes include short-period comets). It's assumed that they have standard reflectivity, or albedo. However, if their surfaces are dark, absorbing more light, then assumptions made about their size may be skewed. Some of these objects may be bigger than assumed from their observed absolute magnitudes. Also, their orbits are subject to change, due to external factors (being perturbed by planets in the solar system) or internal factors (internal morphologies of the objects, their spin rates, whether they have satellites, and so on). 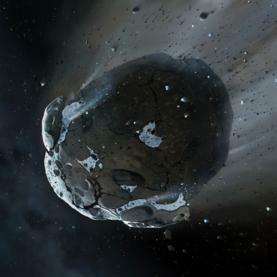 The best way to determine the properties of these asteroids is by use of radar techniques, and NASA is targeting a number of these Potentially Hazardous Asteroids for study. One of them in particular, known as 2003 SD220, has recently become the subject of intense speculation by Planet X buffs, who fear that these objects may become even more alarming due to the influence of a sizeable Planet X body in the solar system. This 0.7km wide lump of space rock will pass by the Earth on 24th December 2015 (3), the first of five repeated fly-bys over the next 12 years. The minimum orbital intersection distance between 2003 SD220 and the Earth is currently thought to be a comfortable 6.7 million miles, or 28 lunar distances. However, is it possible that an undiscovered Planet X body potentially have nudged 2003 SD220 onto a collision course with Earth? Even if there is a 'Yarkovsky drift' effect at work on this particular asteroid, the chances of it heading directly towards the Earth are pretty remote. You might be forgiven for wondering what all the fuss is about, to be honest. The whole story hangs on the belief that there is currently a massive unknown body within the planetary zone of the solar system, causing changes to the orbits of various solar system bodies. There seems little in the way of hard evidence to back these claims up. Planet X may indeed exist, and evidence in the outer solar system seems to suggest something is out there, but that's a long way from claiming that it is right on top of us, firing comets and asteroids towards the Earth. These stories make great speculative pieces for the tabloid press, and are gleefully re-hashed by bored hacks (4), but do nothing to bolster the tarnished reputation of Planet X research. Dr Tsiganis has worked with other top academic researchers whose names have appeared again and again during our exploration of the anomalies of the formation of the solar system (2). I've written to him to ask him about this new paper, but have not received a reply. In the meantime, my research colleague John Keebaugh and I have been trawling through Dr Tsiganis's back catalogue of papers. He appears to have spent a lot of time devoted to trying to understand how the solar system was formed, conscious of the fact that the standard model does not get us to where we want to be. 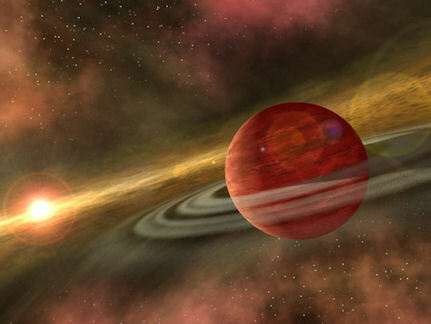 Essentially, the paper outlines attempts to model planetary systems where two gas giants take up a resonant pattern between themselves, even though their orbits are strongly inclined from one another. This they have termed an 'inclination resonance'. Although, on the face of it, our solar system does not feature such a configuration, this paper may address how certain extra-solar planetary systems come to exhibit such high levels of inclination from the ecliptic plane. I say 'on the face of it' because if there's a 'Dark Star' out there, orbiting our Sun at a great distance, then it may well exhibit an orbit at high inclination from the ecliptic. 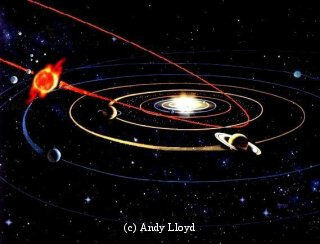 Indeed, Zecharia Sitchin's mysterious planet 'Nibiru' is thought to be tilted at 30 degrees to the ecliptic (4). That said, the orbit of Planet X is likely to be so wide that any talk of a resonance pattern with even Neptune (which shares such a relationship with many of the objects in the Kuiper Belt exhibit) seems wide of the mark. A 3/1 resonance would place Planet X's semi-major axis at about 90AU, for instance, which should be close enough to have been detected. Bear in mind also that most of the larger planets don't, in fact, exhibit resonance patterns with one another (5), so why should we expect an undiscovered Planet X to? Nevertheless, this 2013 paper contains discussion points which are valuable to our understanding of how a Dark Star might have re-configured our own solar system in the distant past. We learn that there are both fast and slow migration patterns of planetary orbits to consider. The fast migrations (Type I) can occur early on, driven by influences of the protoplanetary disk on fledgling planetary embryos. But fully formed planets can also migrate at a later point (Type II migration) and these migrating planets can then be subsequently recaptured into resonant orbits with one another, greatly stabilising the overall system (3). What of the Earth, then? Everyone assumes that the Earth's position is immutable, but is it possible that it began life in a different position? The answer, I think, is yes, because these advances in celestial mechanics show us that influential planets can shepherd each other into stable orbital patterns over time when migration is taking place. So even if the Earth was knocked away from its initial position, the overall system itself would enable Earth to neatly soft-land into a relatively circular, stable orbit over time. Earth doesn't share a resonance orbit with other planets in the solar system (5). 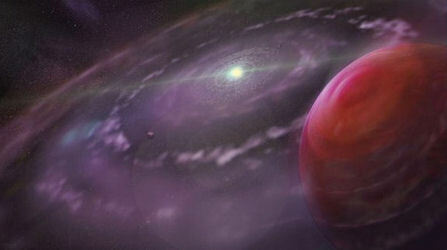 But, as in the case of migrating gas giants (a hot topic these days), that doesn't mean that the principles of migration and resonance could not be applied to Earth's activity in the past, allowing us to see how its orbit may have successfully shifted into one that now appears steady and stable. And this kind of unexpected displacement (as a result of an encounter with a purported Dark star) may be the missing key to explain why the standard model still fails to account for how the solar system now appears, despite multiple attempts to solve this riddle. 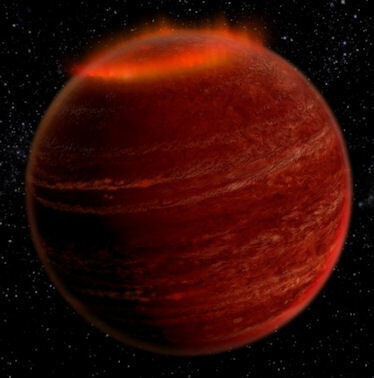 A well-studied brown dwarf, which is well known for its remarkably strong flare activity (1), is now thought to have had a two-year long storm working away in its complex atmosphere. The brown dwarf, known as W1906+40, rotates every 8.9 hours, and a dark patch, located near to one of its poles, has been apparent on its surface with each rotation. Although the dark patch might have been attributable to sun spots, the suspicion was that it might be a significant cloud formation on this L dwarf. Although brown dwarfs are part of the star spectrum, they have both stellar and planetary properties. Their upper atmospheres have complex cloud formations made up of tiny minerals. This activity extends, in this case, to an ultra-cool dwarf which has also been seen to emit the strongest solar flare known among this category of objects. I continue to think that our solar system contains just such an object. What I'm less certain about is how far away it is. As time has gone on, and infra-red surveys have failed to uncover such an object, it seems likely that an undiscovered sub-brown dwarf would have to be a very considerable distance from us presently, of the order of tens of thousands of astronomical units. That's not to say that it doesn't periodically sweep in towards the planetary zone as part of a highly elliptical orbit around the Sun, but the object would more closely resemble the 'Nemesis' body thought to account for periodic mass extinctions on Earth. Interestingly enough, that theory still seems to hold some ground (7), despite WISE failing to pick it up during its detailed infra-red sky survey. 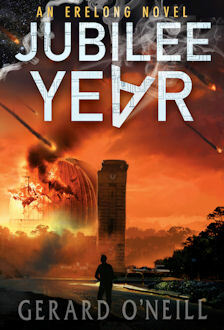 I recently had the pleasure of reading Gerard O'Neill's Dark Star-themed novel 'Jubilee Year'. The author incorporated a great deal of Planet X lore into the book, both good and, well, not so good. He described how the Dark Star system hid behind the Sun for a prolonged period as it came into the solar system, peeking out from behind the Sun so that the phenomenon could only be seen during sunrise (or sunset). This concept is widely discussed across the Internet by many who think that the images generated of Sun Dogs and lens flares show a partially hidden Planet X body. Although this is fine for the purposes of a doomsday sci-fi novel, there are several basic problems with this scenario, which I'd like to address here. The Earth orbits around the Sun very quickly by solar system standards. As it does so, we are able to observe a vast sweep of the solar system - North, South, East, West - over time, dependent upon where we are situated on the globe. You don't need to go to the Antarctic to see the southern celestial pole, for instance. Pretty much all of the celestial sphere can be seen from various parts of the Earth; with the exception of the relatively small part of the sky occluded by the Sun at any one time. So, if you think there's a hidden Planet X bearing down upon us, then it's natural to want to hide it in the small patch of celestial real-estate located behind the Sun. In the time it takes for an incoming planet/system to arrive at perihelion from, say, Saturn (the most distant, visible-with-the-naked-eye gas giant) to perihelion between, say, Jupiter and Mars, sufficient time must pass for the Earth to have swept from one side of the Sun to the other - at least once, but likely a few times. So, for such an object to remain behind the Sun all that time, it would have to be essentially following a mirror-opposite motion around the other side of the Sun from the Earth. It follows logically that the longer it stays hidden from view behind the Sun, the closer its orbit approximates to just 1 Earth year. Clearly, this is nonsense, unless we're hunting a mirror twin of Earth located on the diametrically opposite side of the Sun. To get around this problem, you might be tempted to argue that this Planet X object has been propelled into the inner solar system incredibly quickly - coming straight at us in a matter of weeks, all the time located just out of view behind the Sun. But if that's the case, with Planet X arriving in just the few weeks it takes for the Earth to cross one zodiacal house, then the in-coming object cannot be bound to the Sun, but would have to be an unbound inter-stellar object on a hyperbolic trajectory. In other words, it's flying straight through the solar system. By definition, then, this would not be a Planet X object. The second problem with the sunset/sunrise scenario so common among Planet X debates online is that these images have been appearing for years and years. They can't all be right, or even a substantial fraction of them, because a perihelion passage lasting years like this would fall foul of the issue I raised at the top of this email. Therefore, QED, the majority of these reports must be false. Logically, the longer these reports go on, the less likely they are to be real. You then have to ask, which ones are real, and which ones false? The old ones? The new ones? More likely, if most of them are evidently false, then probably all of them are false: Misidentified phenomenon, like camera artifacts, or environmental/meteorological effects generated by the light of the setting Sun. Really, what Planet X hunters should be looking for are newly discovered objects located in the outer solar system with anomalous trajectories; not objects alleged to be right on top of us, hidden by the Sun. To paraphrase Indiana Jones, the sunset viewers are looking in the wrong place. There's also a third problem with the 'sunset scenario'. That is the relative magnitude of the Planet X body compared to the adjacent Sun. The Sun essentially obliterates out the comparatively faint light from objects adjacent to itself, such is its over-powering brightness. To ponder this issue, consider how hard it is for astronomers to image exo-planets, even massive ones, in orbit around other stars. It's not that they're incapable of viewing the miniscule light reflected from these planets in their powerful telescopes, but that this light is so overwhelmed by the glow of the adjacent parent star as to disappear within it. And so would it be for a Planet X body peeping out from behind the Sun. Don't get me wrong. I'm not saying that a Planet X body doesn't exist out there. Indeed, I am an arch-proponent of such a scenario. It's just that I also think that the sunset scenario is a distraction which puts a great many people off from contemplating a possible underlying reality to the Planet X phenomenon. "Wondering if you are at all familiar with work of Dr Michael Newton, a hypnotherapist who has dedicated much of his life to "life between life regressions". In "Journey of Souls" Chapter 11 there is the following passage which I find very interesting in context of Sitchin's work on the Annunaki creation of the worker man. The 200,000 year mention by Newton below and Sitchin's time lines correlate very well. I am not aware of the two men having been aware of each other's work. "...humans, appeared at least 1.7 million years ago. Have souls been incarnating on Earth for this long, utilizing the bodies of these primitive bipeds we call hominids? A few of my more advanced clients declare that highly advanced souls who specialize in seeking out suitable hosts for young souls, evaluated life on Earth for over a million years. 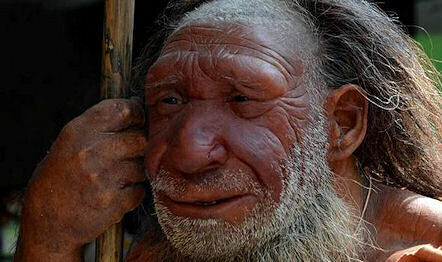 My impression is these examiner souls found the early hominid brain cavity and restricted voice box to be inadequate for soul development earlier than some 200,000 years ago." "Newton's research into the nature and purpose of Souls is at very thorough. Reminiscent of Sitchin's work on the Annunaki. After reading 'Journey of Souls', you might think he has covered everything there is know about Souls from death to rebirth, but you would be wrong. The sequel book 'Destiny of Souls' moves on the soul special situations and purpose, including role in some paranormal occurrences. Therefore also highly recommended. "I believe the Circa 200,000BC time reported by Sitchin for the creation of the first Adam & Eve, Newton's reported time of the first incarnation of souls on Earth, the emergence of Neanderthal Man, and the discovery of the mitochondrial Eve in Africa all correlate quite nicely." One of my great pleasures is rock music, and I am a fan of the Finnish symphonic metal band Nightwish, who have recently gained the services of a wonderful new vocalist. They played only one gig in the UK this year, but it promised to be outstanding. 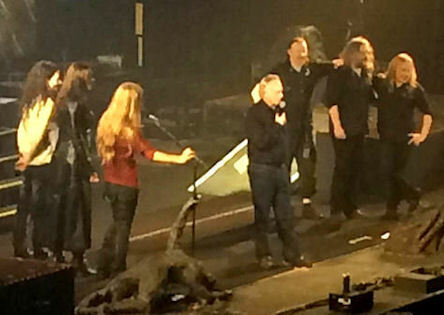 The venue was Wembley Arena in London, just before Christmas, and rumours quickly swirled about that the band had invited along Professor Richard Dawkins, whose Darwinist book "The Greatest Show on Earth" had inspired their latest album "Endless Forms so Beautiful". I've posted up a gig review, to sit alongside two previous reviews of Nightwish concerts (each with a different vocalist). Suffice it to say that it was the most amazing performance, and that the good Professor did indeed make an appearance at the end of the night to read out the passage that ends their 2015 album. You might wonder how metal and academia became such easy bedfellows. It is clear that Nightwish have an enlightened passion for science, as well as a deep respect for Dawkins' writings on atheism. Such a stance might be considered risky in some parts of the globe, but in London town the roar of approval from the black-clad crowd was something to behold.